Passionate about clear and concise writing, my degree in Public Relations, combined with over 20 years’ (eek!) experience in PR and marketing, stands me in good stead to help you to achieve beautiful word relationships in all of your collateral. For me, it’s about finding out as much as possible about you, your brand, your product or service. What market are you looking to attract? 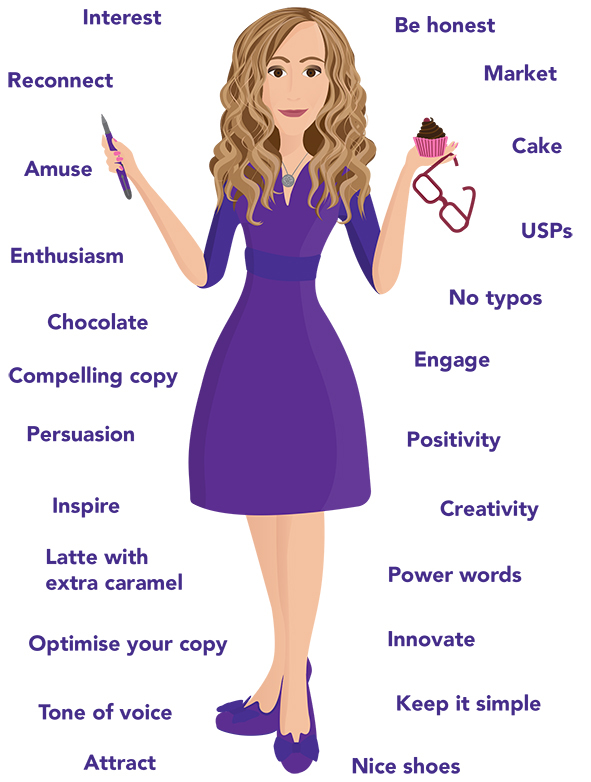 Once I have all of this information, I can then go to work on creating powerful copy in the right tone of voice to attract and retain potential clients. All sizes and types of businesses across a variety of business sectors – both for consumer and business markets. From start-ups through to large corporates, I’m happy to help. I understand that you may have tight deadlines to keep. I pride myself on delivering a quality and flexible service. If you need a project turned around quickly, just let me know and I’ll do my best to have it completed within the time required. Having developed close working partnerships with excellent local designers, web designers and printers, I’m able to deliver a full service for all forms of marketing and public relations collateral as and when you require – whether on a one-off or long-term basis. I’m determined to get the best price for good quality services that will ensure your project is delivered with outstanding results. I’m also a Member of the Chartered Institute of Public Relations and The Professional Copywriters’ Network. SAY HELLO today to find out more about how I can help you and your business. We’d love to hear from you to chat about your copy requirements.